The Gear Fit is Samsung’s take on wearable wireless health trackers. Aimed at heart-rate based training, the Samsung Gear Fit activity tracker provides monitoring and tracking for 4 types of activities. Placed in the $100 price bracket, it is directly in competition with other HR trackers like the Garmin Vivosmart HR and Polar A360, but a bit cheaper. Even the Gear Fit is marketed as a 24/7 wearable, but its features fall short. The hardware of the fitness tracker is great, but it is the software that betrays it. We’ll find out why further in this article as we discuss its features and design. Let’s begin with an overview of its design. The Gear Fit is designed for all day wearing for which a soft band is a necessity. Rightly, the band is soft and comfortable to be worn all day long and the tracker’s lightweight built is not a cause of concern if you are worried about weight. However, the strapping mechanism of the band is not very secure; there have been instances where the band would pop out unknowingly. But on the bright side, the bands are interchangeable and available in various colors. This activity tracker has the biggest and brightest display for a fitness tracker in this category. Measuring 1.84 inches diagonally and a screen density of 244 ppi, the gadget’s curved Super AMOLED display make colors distinctly visible. But the screen is not as bright under the sun; you can manually increase the brightness, but it goes back to its original settings in a few minutes to save battery. The display is curved and that looks great; unless you are under the sun when it keeps on catching the glare. The device is also dustproof and water-resistant like its peers. On the back of the display is the optical heart-rate sensor. To charge the device, the Gear Fit must be connected to a small charging dock which in turn connects to any micro-USB charger. This is a nice touch, but the dock is too small to not lose it. The Samsung Gear Fit activity tracker might not be a smartwatch, but it has some smart features. You can read notifications from your phone on your wrist. Although the elongated display makes it hard to read either horizontally or vertically, with smaller text size you can manage to read them. To switch between screens and settings, you can swipe through them; transitions are smooth and responsive. Heart rate is monitored continuously when in exercise mode. There are four types of exercise modes: walking, running, hiking and cycling. Surprisingly, you’ll need to turn on the pedometer separately even when you are in walking mode and even then it will turn off on its own. This is one of the major drawbacks of this device. All fitness trackers measure your steps continuously throughout the day and it is really annoying when your fitness tracker gives up on you during your jog. The heart-rate monitor is also spotty at tracking your beats. Maybe it is unable to make clear contact with the wrist. If that’s the case, then Garmin’s Vivofit HR’s protruding optical sensor was a smart design. The Samsung Gear Fit fitness band’s battery is claimed to last 3-4 days, which is tested to be true by many owners. Still its battery backup is definitely not as good as others, mostly due to its AMOLED display. The Gear Fit runs on what Samsung calls integrated S health software and to synchronize with your phone, you’ll need to download the Galaxy fit manager app or S health on your mobile device. If you already have a Gear Fit compatible device, you’d be familiar with S health. That brings us to another serious drawback: limited compatibility. The Gear Fit is compatible only with select Samsung devices, all of which run on Android 4.3 or later. Although there are unofficial ways to sync data with non-compatible devices, still iPhone remains out of purview. The training gadget supports many watch customizations and its AMOLED display makes those look beautiful. Double-tapping the home button brings up customization options on the unit and three taps sends a panic message to your emergency contact. Change the look of the activity tracker with extra bands. The wristband on the Gear Fit can be replaced so there are plenty of possible ways to buy a new band and get a new look of the activity tracker. It is also possible to buy screen protectors which I always recommend for products with displays. It’s so easy to bump into something and scratch the surface. The Samsung Gear Fit activity tracker is hands down the prettiest of all fitness bands at this price point. Moreover, it is IP67 certified to be dust-proof and water resistant; but is not swim-safe. It has an additional gyro sensor to detect gestures for screen wake – but still waking the screen is a hit and miss. Notifications are rich and responsive and look great on the AMOLED display. However, there are some obvious drawbacks. Its default horizontal display is inconvenient to read as well as scroll. There is no way to look at it without awkwardly tilting your head. Even if you were to correct the orientation from settings, you’ll end up with unpleasant text to read. One of the main drawbacks is its coaching software. Samsung provides a coaching software which does nothing but log data of your workouts. You cannot learn anything meaningful from your steps or heart-rate unless you apply and compare with a training schedule. For example, if you decide to take a break in the middle of a jog, the Gear Fit would prompt you to continue your pace based on your heart rate even if you were standing still. Then, if you choose cycling activity, the device requires GPS signal from the phone to calculate distance. Any other device would have simply calculated calories burnt based on your heart-rate. You also need to turn the pedometer on separately after selecting your workout activity. It can track sleep for you, but you’ll need a separate app that logs your sleep. It appears that the Gear Fit manages to makes fragmentation possible even on its already narrow ecosystem. So, in the end, what is Samsung Gear Fit actually able to do? It doesn’t track your continuous steps, doesn’t provide coaching based on your training history. Then? Maybe it is just a fancy watch that tells time with gorgeous backgrounds. 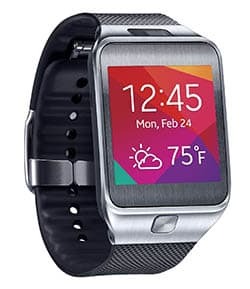 Where Can I Buy Samsung Gear Fit? Always click the button to check recent price and additional info. Sometimes there are sales. If you are in or close to the USA click the top link to check recent price and additional info. If you are in or close to the United Kingdom, click the bottom link. If you happen to have any other questions or comments on my Samsung Gear Fit review, do not hesitate to leave me a comment below! Dimension 0.92" x 2.26" x 0.47"
Interaction Touchscreen, svipe and tap. Power button. Garmin Vivofit Jr – An activity tracker for kids! Guess i’ll pass on this one. The thought of getting something like this has crossed my mind. I’m not a tech guy and didn’t read the specs. Thanks for the review. I’ve been looking into getting a “fit accessory” for android and you’ve given me a great overview of what’s what. BUT I see this is no good for me as I have a Sony 🙁 .. I’ll go see if you have any info on gadgets that fit the Sony Experia! No, the Samsung is a bit weird in that sense – it only fit Samsung smartphones. But don’t worry, almost every other fitness tracker fit most other iOS and Android phones. For instance, the Garmin Vivosmart HR is a good choice. SAMSUNG GEAR FIT looks great!! I love sports and I live a healthy lifestyle and therefore I will be looking forward into buying the fitness tracker. The design looks very great and with a nice style. Also, your review was very thorough and you really hit on all the important marks + the price is affordable. Thanks for the comment. 🙂 I can surely agree on that it looks great. The designers have done a good job on the exterior. Glad you liked the product and my Samsungs Gear Fit review. I think the size of the display is very important on these gadgets as they are being used more and more by folks who need the health monitoring; older people. These people don’t always have the eyesight to look at those smaller screens. As more work is done on these fit bracelets, I’m sure they will become the norm and very helpful for everyone. Until then this Samsung gear fit activity tracker looks like a winner. I don’t personally have one but have been watching out for them to find one that might fit into my life. Great review. Thank you for your input, Debra. For people who wants a bigger display and still want a Samsung activity tracker, the Gear 2 smartwatch is larger. But it’s a discontinued product so it might be difficult to get hold of. I am a Samsung user for a few years now and never really tried their gadgets. This one seems very interesting. Like you said, this is not swim-safe but is it water resistant or sweat resistant? Samsung says in their manual under ‘Maintaining water and dust resistance’ that you can drop the device in 1 m of clean water and it should be ok, but don’t keep it submerged for more than 30 minutes. They also say that if the device or your hands are wet, dry them thoroughly before handling the device, and do not expose the device to salt water, ionized water, or soapy water. So to be on the safe side it’s probably a good idea to take it off in the shower, but it shouldn’t stop you from training and be sweaty. Just wipe it off when you are finished with training. An activity tracker should handle a normal amount of sweat. This post is great! I wish I had found it before I bought my last activity band! The Tech specs are the most important part for me, thats what I look at straight away and then read reviews and other info! Keep up the great work! Great page. Awesome use of content, pictures and video. Super informative. I like the overall layout of your page. It is one that keeps the eyes entertained and looking for what might be next. I think your page is one of the few I have seen that have made their Heading words bold enough to realize its a new statement. Keep up the good work. Thanks for the kind words Rob. 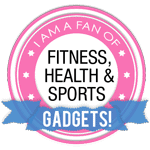 Good feedback makes me want to continue working with my fitness gadget page. The design is cool and looks very light weigh. But I have to agree with you that the functionality of the Samsung Gear Fit is the drawbacks, just by reading your article I am already to pass on this gadget. The worst is that it is not 100% waterproof. A let down I must say.